I employ laser range finders to determine the distance of the representative golfers. 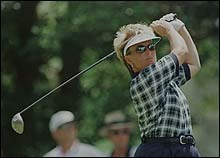 John Daly led the 1997 Tour with an average distance of 302.0. Jane Geddes' average of 261.3 was just 1.7 yards short of LPGA driving distance leader Smriti Mehra. 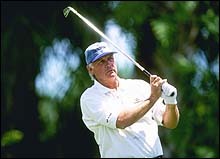 John Jacobs moved from second in 1996 in driving distance to first in 1997 with an average of 290.7 yards. Many tour players never face holes which they can't get on in regulation. In fact, there are few par 5s too long for them to hit the green in two. 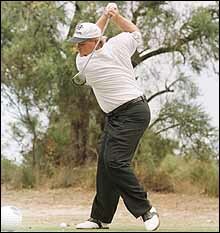 Daly is the PGA Tour leader in driving distance with an average of more than 300 yards. Even John Jacobs' average on the Senior PGA Tour of 290 yards and rookie Smriti Mehra's 263 yards on the LPGA Tour are impressive. Although distance is not everything in golf, it is a critical element to scoring. This is indicated by course handicap rating systems starting with the length of the holes. For most short hitters, reaching the green in regulation can be practically impossible on medium-length and long par 4 holes. These golfers can only make a par on such holes by one-putting, after a pitch or longer third shot. How far do these less-than-the-longest-golfers really hit their shots? Little is available on this subject because it is so hard to quantify. Each golfer is an individual, using different brands of golf balls, their golf bags are filled with various makes and lofts of clubs, plus each day at each course brings its own playing conditions. Even trying to classify golfers into homogeneous groups or types, to find out how far these golfers hit each club, is an involved exercise. Nevertheless, getting some idea of how far "types" of golfers hit their clubs could be valuable to certain people in the golf industry and of interest to some golfers. Operators of courses could use this information as a guide in locating sets of tee markers for their players. Golf course architects would have a better idea in providing teeing surfaces for new courses or in remodeling older courses. Tournament committees could find it a help in adapting the lengths of the holes for competitors in an event. Some golfers might simply like to compare their length with that of other golfers. To get a better idea of how far golfers hit, I decided to measure the shots of representatives of eight general types of golfers. 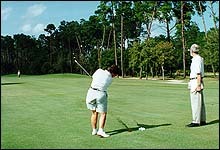 For this I selected a flat fairway of a course I had designed near Daytona Beach. Two of that club's golf professionals were co-operative, agreeing to both have their own shots measured and in helping to find six other representatives from among the members. A laser range finder made my measuring of all their shots easy. I could have also measured the roll of each normal shot. This wasn't done because roll can vary so much depending on the conditions of the turf and whether shots are hit to a fairway or a green or other contour changes. Due to these variables, I estimated the amount of roll for each shot. At the USGA's test facility in Far Hills, New Jersey, drives which averaged 255.3 yards of carry were reported to have an average roll of 22.7 yards. This figures out to the roll being 11.2% of carry. I felt this was above average for the lush fairways on any American golf courses and too large a percentage to use for shots hit to greens. For drives I added a roll factor of 8% of the carry. For the representatives' next longest metalwood, a roll of 4% of its carry was added. And 2% was added for all other clubs. I know these are arbitrary percentages and certainly roll differs widely depending the clubs used, on how each golfer hits their shots, the golf ball, where their ball lands and other factors. A figure for total, carry plus estimated roll, is listed in bold print in the second column for each representative. From my measurements, it could be theorize these representatives could reach the middle of the green on the following length holes. For a par 3 hole the maximum length is given, which they could reach with their metalwood next longest to their driver. For a par 4 hole it's the maximum length reachable with their driver and next longest metalwood with their second shot. The par 5 hole listed below would theoretically require their driver, next longest metalwood and a third shot with a 5 iron to the middle of the green. Measurements of this small sample of golfers far from considers all golfers and all conditions. However, given below are some observations, possible applications or speculation from these results, especially the large differences found between how far golfers hit a golf ball. Short hitters likely cannot reach mid-length and long par 4 holes in regulation. For long hitters, most par 5 holes are two-shot holes or at most take only a short third shot. Most courses probably don't require anywhere near an even distribution of clubs during a round by many of its players. For short hitters, the holes demand a much greater number of shots with long clubs. After driving on par 4 holes, long hitters more often use their lofted clubs for approaches to the greens. And this should be more true for touring pros. I noted that most of these participants did not have an accurate idea how far they hit their clubs. Most thought they hit farther than they actually did. Although not permitted in competition, laser range finders are not very expensive or in some places can be rented. This precise instrument can let golfers rather quickly measure the length of their shots with each club. By learning the distance they normally hit each club and knowing the length of approach shots, most golfers could probably lower their handicap. Short hitters don't get much difference in yardage between their consecutively numbered clubs. This would seem to make it difficult for them to pick exactly the right club. Some of these golfers might be able to play as well with every other numbered club, while making their selection of clubs easier. In order to be as fair as practical to the competitors in a tournament, whoever is setting up the course should locate the length of tee markers to cups to consider the hitting strength of the players who will be competing. If the back tee surfaces are used for the markers on some long holes in medal play, this could be grossly unfair to the short hitters in the field. If it is hoped that golfers of different hitting length are to use approximately the same clubs on the holes, there would have to be a larger distance between the sets of tee markers than is now possible. Few courses presently have teeing surfaces which can accommodate doing this. Golf course architects remodeling courses or designing new courses, who want to more closely achieve this goal, must sufficiently spread out the teeing surfaces. The operating staff of these courses must then provide enough sets of markers and daily locate these properly for all types of golfer. The final step is that golfers must play from the markers which best fit their length. These would not only make all of the holes more equitable and fun to all golfers, but on busy courses would better distribute the wear on the tees. Instead of so much stretching out of sets of tee markers as a solution to the tremendous difference in how far golfers can hit a golf ball, perhaps more golf courses should be built primarily for short hitters. These would be smaller courses with shorter holes. Almost everywhere there seems to be a large number of golfers who do not hit a "long ball", but who still want to receive the benefits of golf. Naturally, there should still be the more-acreage-demanding and costly "championship" courses for long hitters. As a golf course architect, I know the "head start" which long hitters have could be somewhat reduced by designing some courses with a different composition of holes than is traditional. More par 3 holes could remove some of the huge advantage long hitters have on the par 4 and par 5 holes. These latter holes typically begin with a driver from the tee and can be followed by a long second shot. On both of those shots, long hitters usually have a significant advantage. New courses with a greater number of par 3s would also have reduced initial land requirements, construction costs and annual maintenance budgets. An adjustment in the way golf balls are made could somewhat limit the distance obtained by long hitters, while allowing short hitters to play close to the same game they do today. I have been told by golf ball experts that it is an easy matter to make such balls. Another positive outcome of so modifying golf balls would be to restore the challenge to long hitters of many of our classic courses, as Pine Valley, Cypress Point, Merion and others.